There is an ongoing debate regarding the value and/or wisdom of the German Government’s implementation of an energy transformation – the Energiewende. The primary driver for this initiative was the policy decision, first made in 2000, to eliminate nuclear power in Germany. Nuclear generating stations contributed as much as 25% of the electricity supply in the late 1990’s. Germany has successfully developed a very significant base of renewable energy over a sustained period of time without going bankrupt or causing unbearable economic hardship to electricity consumers whether they be residential or industrial. This is a very laudable achievement – one that many observers would have declared impossible. The Energiewende in and of itself represented enough of a demand for wind turbines and solar panels to have resulted in very significant decreases in the prices for all of the components associated with these technologies. As every country in the world develops their own renewable resources they will ultimately enjoy substantial cost savings due in large part to the Energiewende. Germany has spent far more public money, in the form of direct grants, tax incentives and utility rate increases than was needed in order to attain the same level of renewable energy generation that it enjoys today. Germany, like Denmark, has only been able to develop intermittent renewable energy resources because of the high capacity inter-connections with other large European energy providers/consumers. In effect, Germany and Denmark have used the European and Nordic grids as a large battery. It follows that if other European countries were to follow the path taken by Germany the system as a whole would soon run out of capacity to deal with the fluctuations in renewable energy production. The German Energiewende has not resulted in less dependence on the burning of coal to generate electricity and will not do so anytime soon. The preferential access to the grid that is given to renewable energy production has frequently pushed thermal generation off-line for extended periods of time, particularly at mid-day on windy days in the springtime. These base-load plants were designed to run 24×365 and the business cases underpinning the financing of these plants assumed high utilization factors. As a result these plants are marginally profitable at best. The market response to this situation would be to close many of these plants to reduce capacity and stabilize wholesale prices. That is not possible because all of the thermal capacity is required in the late afternoon and into the night on calm days. These facts (see detailed discussion below) lead me to the conclusion that the Germany Energiewende has achieved remarkable changes to the energy economy of the largest country in Europe. Unfortunately, I believe that the approach taken was far from optimal and has influenced many other jurisdictions around the world to follow a similar non-optimal path. I also believe that without finding an economical and hugely scaleable energy storage system this approach cannot proceed much further. I suppose you could argue that the impact of the Energiewende on Wind and Solar Component Prices has not been significant but given the scale of development and the timing it seems clear to me that there has been a large impact. Until China got moving on solar panel installations Germany was purchasing about half the worldwide supply and still represents about 25% of installed capacity. Germany has also been one of the largest purchasers of wind turbines consuming about 10% of the worldwide supply from 2004-2010 dropping to about 5% more recently as other countries have accelerated their development of wind resources. The biggest failing of the Energiewende has been the investment in subsidies of roof-top solar panel installations. As I have argued in another blog posting even under the best of conditions in arid regions between 35 degrees latitude north and south roof-top solar does not make sense. Installations are complicated and expensive, roof pitch and orientation is never ideal and there is no ability to implement sun tracking. In the case of Germany which is located between 48 and 52 degrees north latitude subsidizing roof-top solar panels is pointless. The graph below summarizes electricity consumption and solar power production in Germany in 2013. Solar power production peaks at about the same time German electricity consumption is at a minimum. For those months solar can meet about 11% of total demand (as much as 30-35% at mid-day on sunny days). The real problem comes in the winter months when German consumption of electricity is highest. In the months of December and January German solar production is about 500 GW-Hours which meets about 1% of demand. Even if Germany was to double the number of solar panels that have been installed over the past 15 years it could meet only 2% of winter demand and in that situation there would be a huge surplus of solar power at mid-day in the summer. There is no solution to this imbalance between winter and summer insolation which is the primary reason that solar power is so ineffective in Germany. I am not alone in my criticism of the German approach. A recent report states that Germany has in effect wasted over $100 billion by focusing on solar power. The study suggests that if the same amount of financial support had been directed towards developing solar power in Spain together with additional transmission capacity in central Europe then northern European Countries would have access to much more renewable energy when they need it most in the winter. It is undeniable that solar panels generate a lot of electricity in Germany. But it is also true that the return on the investment made in solar power has been very poor both in financial and environmental terms. Statements similar to this come out on a regular basis, usually in June or July. They are factually correct and impressive but they can easily lead the reader to conclude that the majority of electricity in Germany can be generated from renewable sources quite often. It is in fact a very rare event. On very low demand days between May and August when winds are blowing strongly Germany can see renewables reach those levels for a few hours at mid-day. However, there are many, many more days and even more late afternoons and evenings when renewables make almost no contribution to the electricity supply. This can be seen by the annual average generation by renewables which stands at about 25%. Renewable penetration of 25% of total generation would be very impressive if it was actually used in Germany. However, just as in Denmark which makes similar claims regarding wind as a percentage of total generation, a large amount of renewable generation in Germany is of absolutely no value. 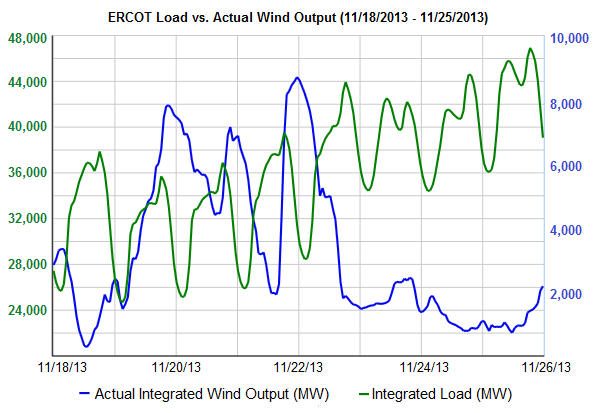 This is solar energy at mid-day and wind energy at night when there is insufficient domestic demand. 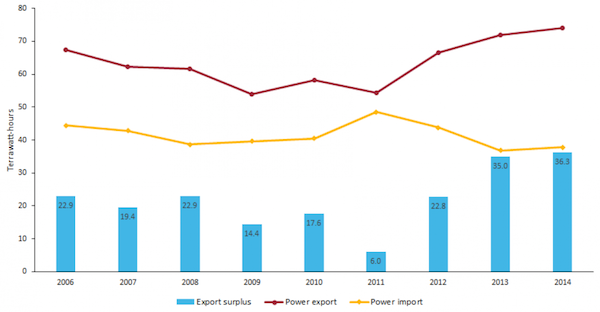 In those circumstances Germany has no choice but to export this surplus electricity at very low prices (sometimes negative) and Germany’s neighbours have to absorb this electricity whether they need it or not. The Czech Republic, France, Poland, and Switzerland have been complaining quite bitterly about the negative impacts of these exports. Stress on the regional grids, the need to cycle power sources in those countries in response to the fluctuations in German generation, and low wholesale spot prices are issues that are increasing in severity every year. 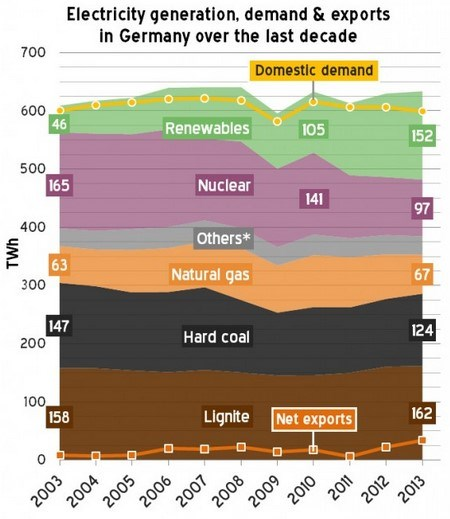 One of the claims by supporters of the Energiewende is that the growth of renewables will allow Germany to reduce its dependence upon coal-fired generation thereby reducing CO2 emissions. That has not happened over the past fifteen years and reducing coal-fired generation will not take place anytime soon. Germany is burning almost exactly as much coal today as it was 10 years ago. A number of new coal-fired plants have actually come on stream in the last 5 years. The addition of natural gas fired plants means that Germany is now generating more electricity from burning hydro-carbons than it was 25 years ago. From the graph it might appear that renewable generation has largely replaced nuclear generation but the situation is a bit more complicated than that. Germany has had surplus capacity for many years (all responsibly regulated electricity markets have reserve capacity) and has exported electricity since before the turn of the century. In the past those exports were primarily nuclear power at peak demand times and prices and German nuclear was a welcome addition to the central European energy mix. Now those exports are renewables at off-peak times and very low prices which cause issues for Germany’s neighbours. It is true that every day of the year renewables make a significant contribution to the electricity supply in Germany, reducing the need to burn hydro-carbons and/or generate power from nuclear stations. The positive impact on CO2 emissions and other forms of pollution is significant. But it is also true that there are many times when renewables contribute very little generation and Germany must make use of all its thermal generating capacity and import power from its neighbours. As a result it has not been possible to retire any significant amount of coal-fired or natural gas-fired generation capacity. Can Price Volatility Guarantee Security of Supply? With renewables pushing conventional generation off the grid frequently and with little notice it is very difficult to operate thermal power plants efficiently or profitably. Frequent and unpredictable cycling of coal-fired and natural-gas fired plants increases operating expenses, reduces service life, and introduces uncertainty into revenue projections. In the absence of any kind of capacity plan utilities are making economic decisions that can be in conflict with the goals of the Energiewende. For example, highly efficient Combined Cycle Gas Turbine (CCGT) facilities are being closed while lignite coal-fired plants remain open. 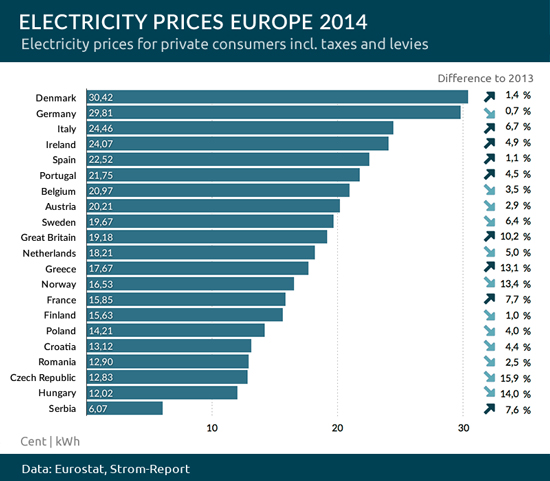 Natural gas is simply more expensive than coal in Europe. As a result the rational economic choice favours plants that emit more than twice as much CO2 as well as harmful airborne pollutants. The heated debate over the need for a capacity market in Germany has been going on for several years. For the time being nuclear plants contribute to a significant oversupply situation. That will change in 2022 when the remaining nuclear plants are due to be retired. Making sure that there is adequate and reliable generation capacity available to replace the loss of the nuclear plants remains a work in progress. The government position at the moment is to allow high spot market prices to be the primary incentive for utilities to maintain adequate generation capacity. German Energy Minister Sigmar Gabriel has stated that “high prices at times of scarcity would ensure that conventional power plants would remain profitable”. The idea is that if prices are allowed to go high enough when renewables are not available (for example on calm nights), then it will still be possible to make a profit running a thermal generation station if only for a few hours on a few days. This is the same approach taken by Texas which has raised its ceiling spot price to $9,000/MW (the average price paid is $45/MW). The response of Texas electricity utilities has been “That dog don’t hunt”. In January, 2014 they took out a full-page advertisement warning of a future plagued by blackouts and system failures. Of course nobody can reliably predict the future so the following comments are pure speculation. I cannot see how Germany can continue to develop significantly more wind and solar resources in the next few years. The imbalances between supply and demand at different times of the day and different months of the year are becoming too extreme. And with so much generating capacity in place it is difficult to imagine utilities building any new plants. What that means when the nuclear plants shut down is anyone’s guess but it does not look like a pretty picture to me. The ability for other European countries to move aggressively with renewal energy development also appears to be constrained by the challenges to regional grid stability introduced by Germany. The need for a pan-European strategy seems clear. Setting up a capacity market in Germany might address the profitability of existing thermal generation but would raise electricity prices. Despite a small decrease in 2014 Germany consumers still pay the second highest retail prices in Europe. Any further increase to support a capacity market would not be welcome. There is certainly plenty of potential to continue developing solar power in southern Europe – particularly CSP plants that can provide power after sunset such as the Gemasolar plant that runs 24×365. The potential to make greater use of Nordic hydro resources through conventional pumped storage schemes or by adding generation capacity in a concept I have termed “unpumped storage” also exists. Both of these approaches would require significant investments in the European grid infrastructure as well as an increased level of political co-operation amongst Euro-zone members. My assessment of the German Energiewende is mixed based upon what I feel is the ultimate goal – an end to the burning of hydro-carbons to generate electricity. Reducing hydro-carbon usage is not sufficient and will not transform us to a truly sustainable energy society. What Germany has achieved so far is impressive. It is impossible to deny that. But I would have preferred to see even 20 GW of renewable energy equipped with storage of some sort so that some coal-fired or natural gas-fired generation could be permanently retired. A financial and policy commitment to storage technology that was as firm as the position taken by Germany with respect to solar panels would have been more constructive in my opinion. If we had affordable and reliable utility-scale battery systems our energy problems would be over. We could easily develop enough wind and solar power to meet our energy demands by storing excess energy generated at mid-day and when the winds were blowing strongly. It would then be available to use at night and/or when the winds are calm. Inexpensive and abundant energy from renewables would also go a long way to solving water shortages in coastal areas around the world because desalination on a large scale would become economically feasible. One energy writer back in 2013 stated that we had already reached the promised land and that concerns about the reliability of wind were effectively over. She was talking about the building of the Notrees battery complex in Texas – the largest such facility in North America. At that time I pointed out the fact that the installed batteries could deliver only 25% of the capacity of the wind farm. More importantly, the batteries could deliver that power for a total of 15 minutes. The facility, which cost $44 million, was not designed to replace the energy output of the wind farm. It was intended to stabilize the output over very short periods of time and to allow for a few minutes to bring on other rapid response power sources when wind was ramping down such as when a weather front passes. Despite the limitations of the Notrees battery complex it appeared to be a step in the right direction. That is, until it was announced that all of the batteries have to be replaced after less than 4 years of service. Oh well, maybe they just got unlucky … or maybe not. The Kauai Island Utility Co-operative also installed a large battery complex in 2012 using the same technology as that used at Notrees and all those batteries also have to be replaced. 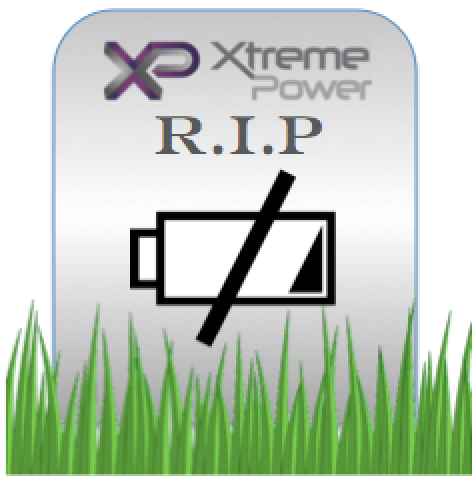 In both cases the replacement batteries will be lithium ion – from Samsung for Notrees and SAFT for KIUC. My personal experience with Lithium Ion batteries in laptops and smart phones does not make me confident that they can last more than 5 years but only time will tell. Regardless of the potential longevity of large battery systems the cost of truly backing up renewable resources such as wind remains unacceptably high. It is worth considering a real world example in order to understand the scope of the problem. Texas currently has over 12 GW of wind energy capacity, the largest amount of any state in the U.S. Many renewable energy advocates make the claim that “the wind is always blowing somewhere” so that periods of calm in one area can be handled by shipping electricity from distant locations where the wind is blowing. I would dispute that contention. 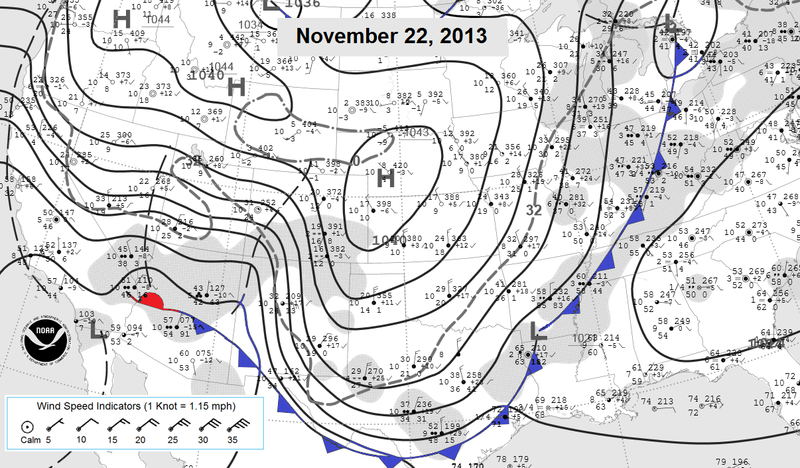 There are frequent occasions when large high pressure systems cover much of the North American continent resulting in calm conditions over very large areas. For example, from November 22 to 26, 2013 the winds across the whole of Texas were calm even as electricity demand increased. The average capacity factor for Texas is about 28% so for this period of time there was a shortfall of at least 1.5 GW of wind generation. In order to replace this “missing” wind generation with energy produced from storage it would be necessary to have 4 days x 24 hours x 1.5 GW = 144 GW-Hours of energy storage. The battery complex at Notrees cost $44 million for 36 MW x 0.15 hours = 9 MW-Hours of storage which translates into about $4.8 Million/MW-hour or $4.8 Billion/GW-hour. The bottom line? It would cost 144 x $4.8 Billion = $690 billion to provide backup for a relatively short period of calm weather for just the state of Texas. If that enormous capital expenditure could be amortized over 30 or 50 years (as can be done with a hydro dam or a coal or natural gas fired thermal plant) then it might make sense. But it seems unlikely that any batteries implemented today would last more than 10 years. Despite the many problems that have been encountered with large scale battery installations and the rather daunting costs there are still interesting projects under development. 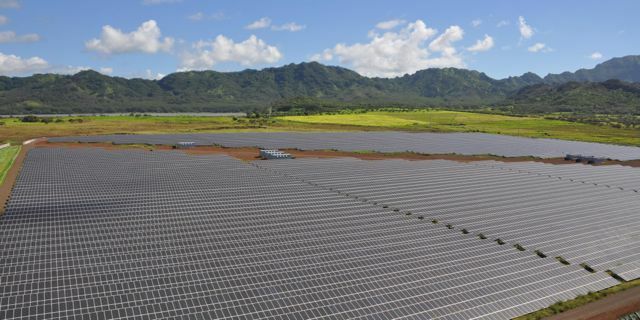 Once again, Kauai Island Utility Co-operative is blazing new trails with the proposed 52 MW-hour array at Kapaia. The batteries will be charged using the output from a new solar array which, for the first time, will not be used to provide electricity to the grid during the daylight hours. The project is going to break ground in the spring of 2016. If successful this project will be the new benchmark for renewable energy storage based upon MW-Hours (the largest such facility currently in operation that I am aware of is a 36 MW-Hour iron phosphate battery project in China). 22-Nov-15: Update: I noticed that another large LI-ion battery project was commissioned in the fall of 2014. The Tehachapi Energy Storage Project came in at about $1.5/watt-hour, less than a third the cost of the Notrees complex so that is a major step in the right direction. Now if only the batteries can hold up we might be getting somewhere. 30-Nov-15: Update: I found another really interesting battery project – AES has been awarded a contract for a 100 MW facility that can deliver power from storage for 4 hours – that’s a total of 400 MW-Hours which will be by far the largest battery storage project in the world. I have not been able to find a reference to the cost of this facility but from comments made by the President of AES Storage the cost would be about $400 Million. Despite Mr. Shelton’s contention that the AES battery storage system is competitive with Natural Gas Peaker plants this would appear to require a very strange interpretation of costs. A recent Peaker plant in Texas is costing about $400/KW of capacity and this plant has an unlimited ability to deliver continuous power. The AES battery solution costs $1,000/KW of capacity and can deliver for 4 hours. So the capital cost per KW-Hour is very much greater for the battery based system not to mention that the electricity to charge the battery has to be paid for and that cost will be larger than the equivalent cost of natural gas. This is a great project but like so many others is being oversold with questionable claims.